What a marvelous trio of readings today, and how impossible to do justice to all three in a few paragraphs: Genesis 1:24-2:3; Isaiah 2:3-11; Proverbs 2:1-22. The Proverbs reading contains basic truth for believers in God: Receive wisdom by following God’s commandments. Nothing profound or radical, but who doesn’t want what verse 10 promises: “For wisdom will come into your heart, and knowledge will be pleasant to your soul”? However, most of us will want to pass over Verses 16-19 with their misogynistic moralizing. “Loose” women need “loose” men to do their thing, but the book of Proverbs doesn’t talk about loose men! 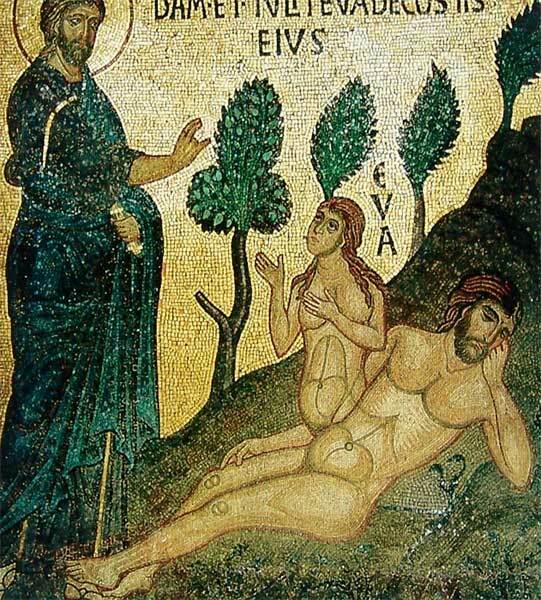 Eve and women in general became the scapegoats to explain male lack of self-control. Note the final words: “neither shall they learn war any more.” The war and gun industries teach war to adults and children through video games, violent films, and aggressive campaigns against any regulation of guns. The NRA makes sure that children can “learn war” from the earliest possible ages! All these stand under the judgment of God in verse 4. It will be a long time before swords are beaten into plowshares, but eventually the haughty will be brought low. If there is one promise in the Bible that I want to hold on to, it’s that one. Everyone and everything that destroys God’s good creation will be brought down… eventually. And indeed, God’s creation is “very good.” That’s how the six days of creation come to completion, with that simple phrase (Genesis 1:31). Her reference to “genealogy” certainly arouses memories of the genealogies in Matthew and Luke, especially Luke, where the genealogy of Jesus Christ is carried all the way back to Adam (Luke 23-38). Our similarity to God is built into our genes – so to speak! A fellow blogger in Scotland, Mike Mair, with whom I occasionally exchange emails, was similarly inspired by the discoveries of scholarship and archeology to write: “Historical scholarship has helped by noting that the god-kings of the ancient middle east used to set up images of themselves throughout their domains as a constant reminder to their subjects and to strangers of their rule. In some cases a digest of the king’s law was inscribed on the monument. In a similar way the author shows God creating humankind as his monument in his world, to exercise his rule and responsibility in it.” You can read the rest of his excellent commentary here. While fasting with the body, brothers and sisters, let us also fast in spirit. Let us loose every bond of iniquity; let us undo the knots of every contract made by violence; let us tear up all unjust agreements; let us give bread to the hungry and welcome to our house the poor who have no roof to cover them. Let us receive great mercy from Christ our God. Categories: Lenten Reflections | Tags: creation of humans, goodness of creation, image and likeness, swords into plowshares | Permalink. 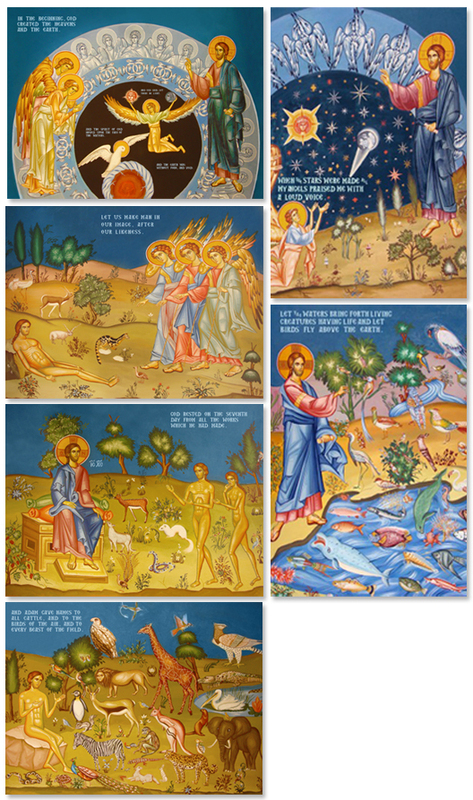 The story of creation continues in today’s reading from Genesis 1:14-23. Everything is now almost ready for the appearance of human beings. I say “almost” because the “fifth day” of creation only brought into being the living creatures of the air and the waters. Land animals will appear on the sixth day, on the same “day” as humans! Somewhere after the “fifth day” or in the middle of the “sixth day” God perhaps took a deep breath and contemplated the final act of creation. Will humans be a blessing or a curse upon the earth? The two other readings for today give us a preview of the answer to that question: Isaiah 1:19-2:3 and Proverbs 1:20-33. The picture in both readings is bleak. The “city” has failed (Isaiah 1:21); Wisdom cries out in the streets of the city (Proverbs 1:20), vainly looking for reason and faithfulness. The human domain has proven to be a failure! But God looks to a restoration, a return to “mountain” imagery rather than “city” landscape! Yes, it is the city Zion that “mountain of the Lord” refers to (Isaiah 2:2-3) and the terms are used interchangeably throughout the scriptures, but here in Isaiah the language serves also to emphasize the failure of the “city” and God’s preference for “mountain” language. In Romans 8:19, we read: “For the creation waits with eager longing for the revealing of the sons and daughters of God…” We will discuss the fuller context of that statement in future reflections, but for now we can stop here at the fifth day of creation and imagine creation and God’s heavenly realm waiting in eager anticipation for the final act of God’s days of creation, and that will come in tomorrow’s reading from Genesis. The narrative is about to reach its climax. But it will be a climax that does not appear separately from what precedes it. God’s six days of creation are indeed one majestic symphonic movement. I like what our Ecumenical Patriarch, Bartholomew, spoke at a symposium in 1997 at the Saint Barbara Greek Orthodox Church in California. 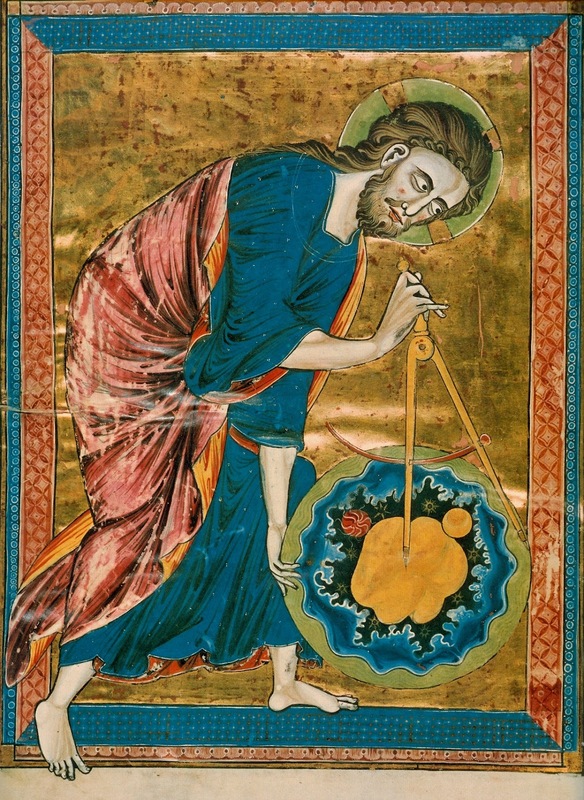 It beautifully expresses the continuity of God’s creative action: “The Lord suffuses all of creation with His divine presence in one continuous legato from the substance of atoms to the Mind of God. Let us renew the harmony between heaven and Earth and transfigure every detail, every particle of life.” I love his use of the word legato, a musical term that describes the interpretive approach that avoids choppy, disconnected articulation and brings out the flow and continuity of musical phrases. It is an approach most masterfully employed by great conductors like Wilhelm Furtwängler. Most of the hymnography this week is influenced by monastic negativity toward the body and its passions. Whereas the bleak pictures that Isaiah and Proverbs have presented to us concern failure to do justice and to know God, the church fell captive to monastic language of self-mortification – for example: “Let us keep the Fast not only by refraining from food, but by becoming strangers to all the bodily passions; that we who are enslaved by the tyranny of the flesh….” and so on, you get the drift. Nevertheless, the genuine gospel spirit survives in some of the hymnography: “Let us begin, O people, the pure Fast that is our soul’s salvation. Let us serve the Lord with fear: let us anoint our heads with the oil of charity, and let us wash our faces in the waters of purity. 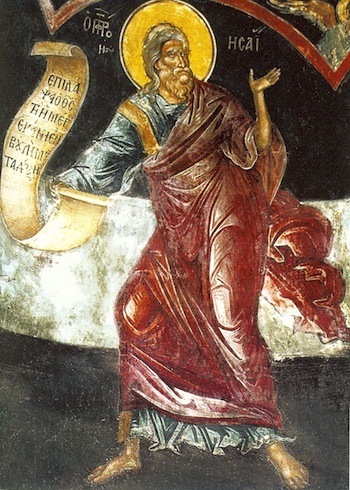 Let us not use vain repetitions in our prayers, but as we have been taught, let us say: Our Father, who art in heaven, forgive us our trespasses in your love for humankind.” One may wince at the idea that fasting is “our soul’s salvation” – clearly that is not the Lord’s teaching – but the rest of this and similar other hymns for this week clearly resonates with memories of Christ’s teaching in Matthew 6:1-18. Say thank you before morning coffee, which is a gift of grace from the water and the soil, which owe you nothing. Celebrate the season of harvest with feasting, the season of scarcity with fasting, the season of new life with dancing, and the season of ripeness with listening. Now that’s what it means to understand the unity and “legato” of God’s creative work. And we share in that legato by harmonizing with the seasons. When you start each day with an attitude of thanksgiving, it is easier to understand how fasting has its place in the grand scheme of things. Perhaps, without consciously knowing it, the church instituted the season of the Fast out of a subconscious understanding of the “season of scarcity” which we call winter. Deep in our collective DNA there is a memory of life without supermarkets, packaged foods, GMOs, and global trade – when life depended on understanding the seasons and our indebtedness to the goodness of the earth. I’ve lived my entire life in cities and I love what the city provides, but perhaps we need some of that wild mountain language that God uses in Isaiah and elsewhere. Jesus himself preferred the desert and the mountains for his reflective moments and encounters. We need the world, this planet and all life on it. 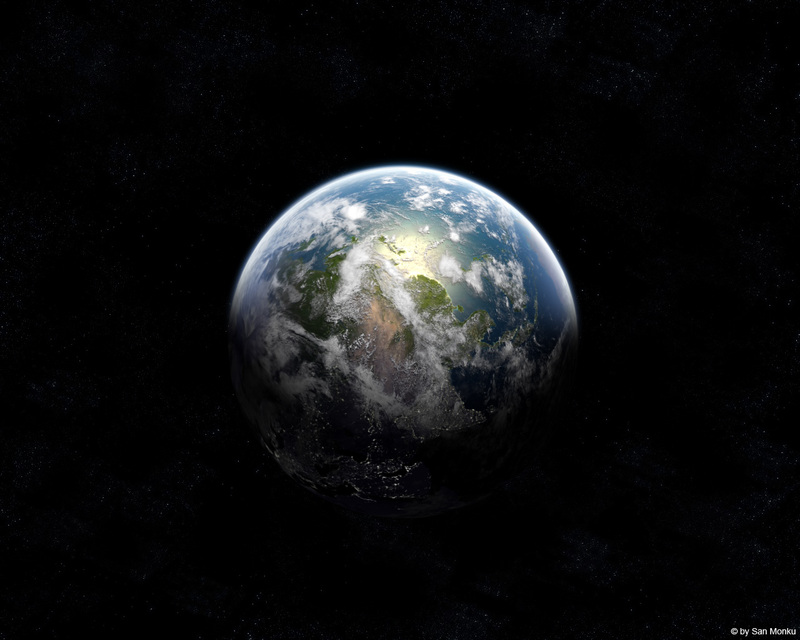 Without it we are incomplete; and without us the planet is incomplete. Can we appreciate that? The future depends on it. 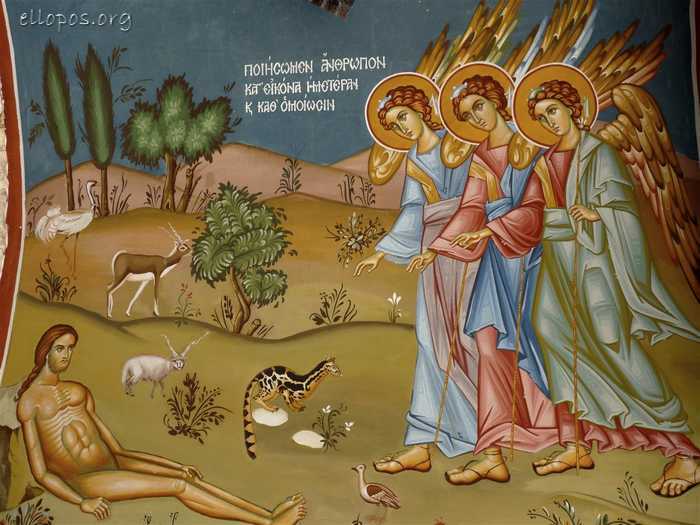 Categories: Lenten Reflections | Tags: Creation, Fasting, Lent, Orthodox hymnography, Patriarch Bartholomew | Permalink. 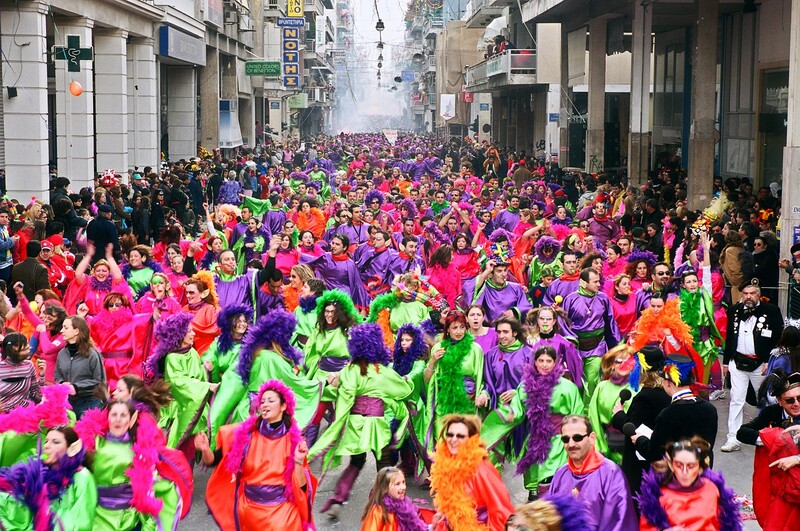 My hometown Patra is best known for its Carnival. 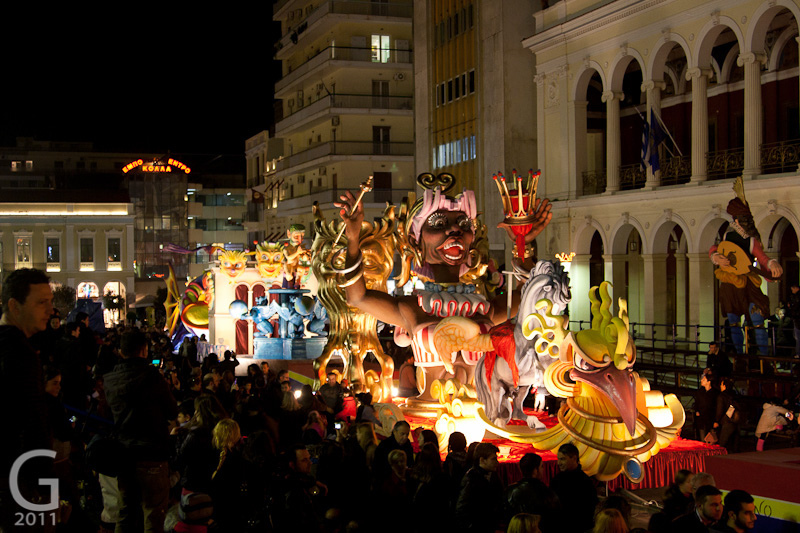 On the last weekend before Lent (Feb 21-22 this year), Patra hosts the biggest party in Greece. 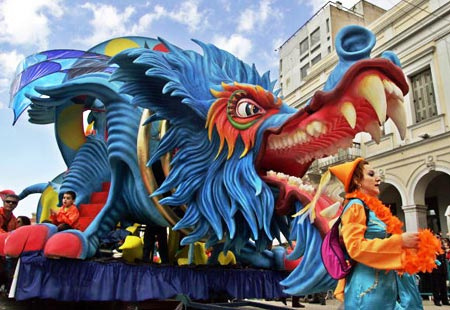 I loved the Carnival parade when I was a boy growing up in Patra. I especially loved all the chocolate they used to throw from the floats. Perhaps that’s where my love for chocolate started. 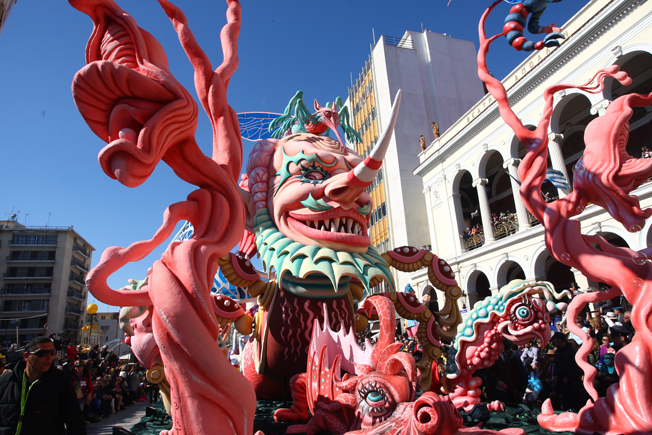 Other cities around the world are known for their carnivals. 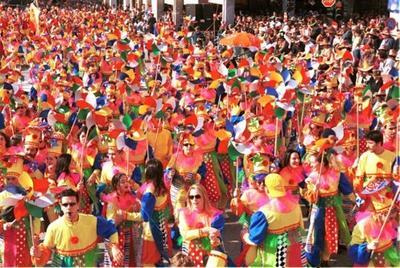 Think Rio de Janeiro – probably the biggest carnival in the world. And in this country New Orleans has its Mardi Gras. Throughout the Catholic world, Carnival is the last big opportunity for excess partying before the sobriety of Lent sets in. And even though Lent has ceased to be much of anything for most people, the idea of carnival persists. People love to party, whatever the excuse. Perhaps the reason why Patra has had its Carnival for such a long time (around 180 years!) is precisely because it had a large Italian population. One of my great-grandmothers was Italian. The word carnival itself (karnavali in Greek) comes from the Latin. The Greek equivalent is apokre-es, and people speak of apokreatiko glendi. But an apokreatiko glendi is not a Carnival. Patra proudly prefers the word Karnavali for its big splash before Lent. It is closer in spirit to the carnivals in Catholic countries than to anything in the Orthodox world. It is, as I said, what Patra is most famous for. 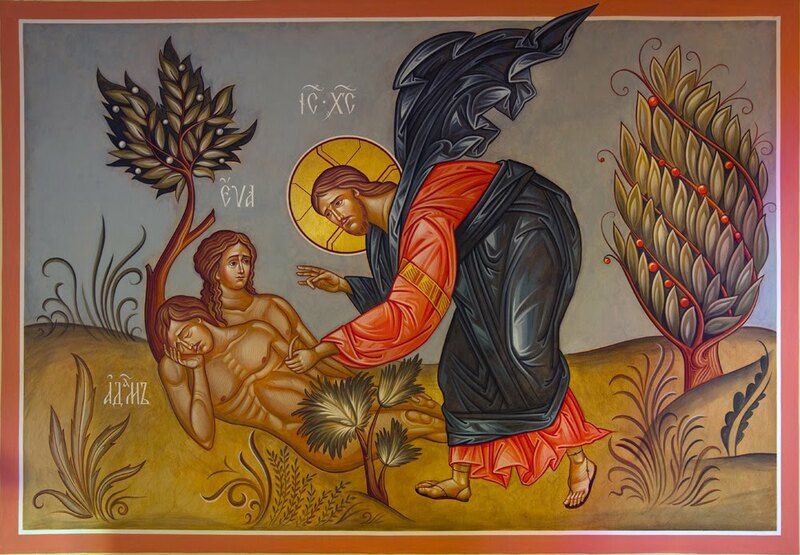 Lent in the Greek-speaking world begins with “Clean Monday” – kathara deutera. That’s today, February 23rd. The label is suggestive of what Lent offers: an opportunity to make a new start, a renewed journey to our authentic self, a new opportunity to see our neighbor and to care for those who are desperate for compassion and understanding. Fasting is the least important aspect of Lent; and quite frankly it’s rather self-serving and self-focused. Fasting that does not open our eyes to the least of Christ’s brothers and sisters is useless. And maybe this is the reason why I think Carnival is such a wonderful part of the whole Lenten idea. 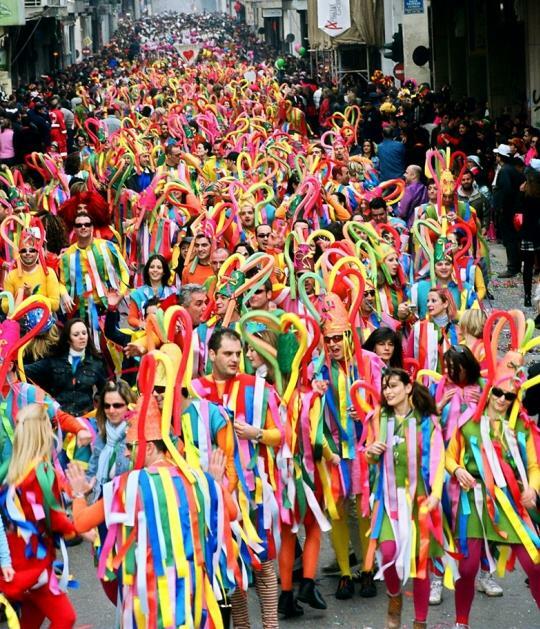 Carnival is a party, the last party before Lent. But it’s a party that is shared by multitudes. There are no restrictions, no invitations. Indeed, it is analogous to that parable in Luke where the banquet is opened to anyone and everyone who cares to come in. Carnival allows the open interaction of strangers in an atmosphere of joy – young and old, rich and poor, Christian and atheist…. 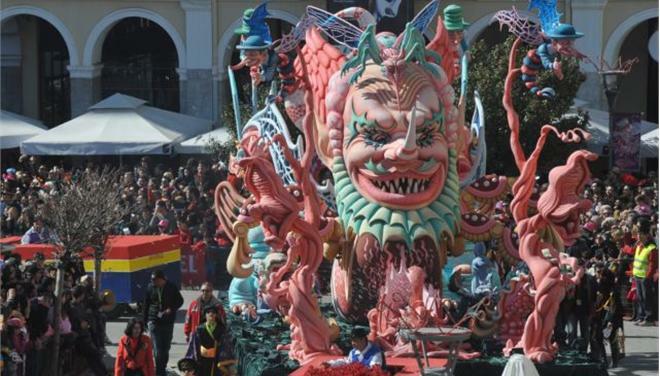 Here are some photos of the Carnival in Patra, 22 Feb 2015, which I gathered from the Internet. 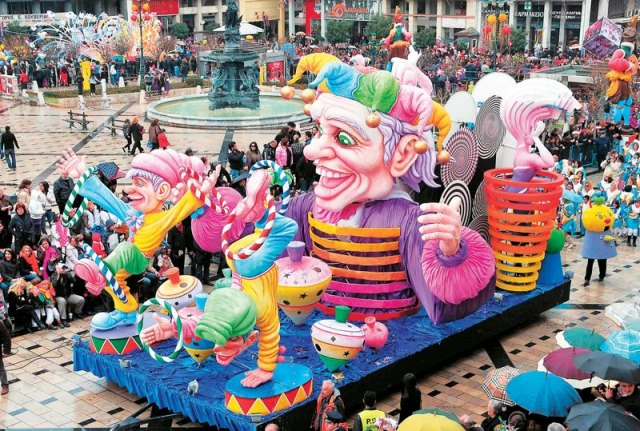 From the looks of it, the floats have become much more extravagant than anything I remember from my childhood years in Patra. I wish I were there. Categories: Lenten Reflections | Tags: Carnival, Lent, Patra | Permalink. His two hands were not enough to express what he wanted to express. That’s how he discovered that he needed a hundred pairs of hands to express what he wanted to express. In other words, he needed a fully symphony orchestra, and that’s how he discovered his calling to be one of the leading conductors of the 20th century, who went on to become music director for life of the most famous orchestra in the world, the Berlin Philharmonic. The same can be said of the Bible. It needed many hands to get its story out. And the story got told many times, in many variations. The Bible is indeed a collection of stories. Jesus himself taught mainly in stories; we call them parables. And three of those parables have prepared us for the beginning of Lent. Three weeks ago, the Parable of the Publican and the Pharisee, taught us to watch out for pride and hypocrisy in our lives. Two weeks ago, the Parable of the Prodigal Son gave us the story of a young man who squandered his inheritance in a far country until he “came to himself.” The parable is a call for us to come home! Last week, the Parable of the Last Judgment (the Sheep and Goats) told us that it’s not theology that decides our standing with God, but rather whether we notice and help those less fortunate than ourselves. Finally, today’s Gospel reading tells us we need forgiveness. And this is why we need forgiveness: Like the Pharisee, we act with pride and hypocrisy. Like the Prodigal Son, we drift far from God. 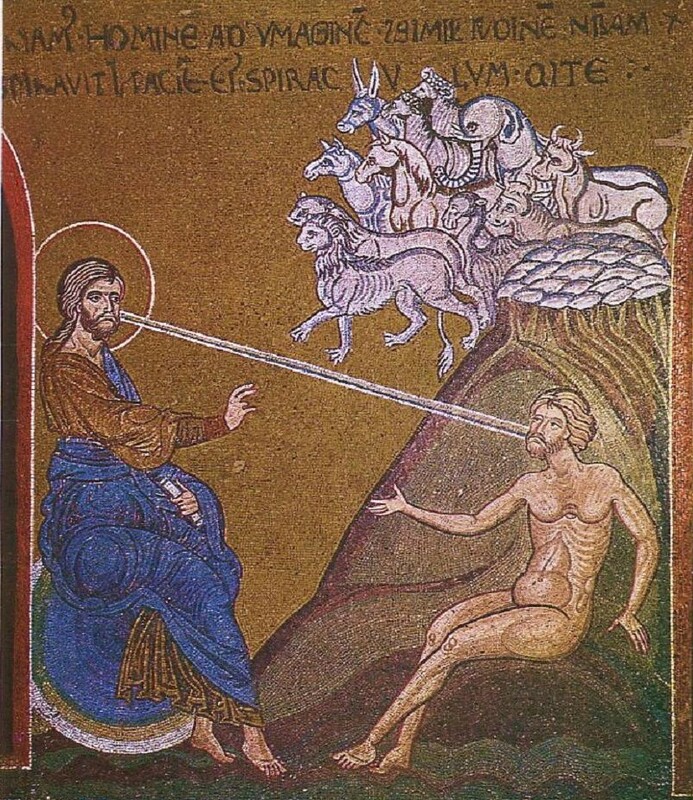 And like the goats at the Last Judgment, we are self-centered and ignore those who need our compassion. In the final analysis, we are invited to enter Lent with awareness that we are not alone. The Christian life is not simply about me and God, my personal relationship with Jesus. You can’t have a relationship with Jesus alone! The Gospel today tells us that you can’t ask God to forgive you if you don’t forgive those who have done bad things to you. Categories: Lenten Reflections, Sermons | Tags: forgiveness, Karajan, Lent | Permalink.